The Shingle Creek Regional Trail in Osceola County will eventually run 20 miles from downtown Kissimmee to the Orange County line, where it will link with the Orange County/Orlando segment of the trail to total 32 miles when completed. The trail runs through Shingle Creek Regional Park, and connects to the Kissimmee Trail Loop. It includes benches, picnic tables, bridges and boardwalks along the way. Best bet for parking is at the Osceola County Welcome Center and History Museum. Detailed map and photos below. Visit the museum at the Osceola County Welcome Center and History Museum, the Steffee Homestead, and Pioneer Village for a pleasant family outing. The trail in Kissimmee goes about 2 miles from Hoagland Blvd. through Shingle Creek Regional Park (Steffee Landing), to the Osceola County Welcome Center, to Pioneer Park. Paralleling Shingle Creek, it includes a scenic boardwalk and a bridge over the Creek near Babb Landing. Future extensions will connect to Orange County. Steffee Landing to Hoagland Blvd. At Hoagland Blvd., the trail links to the Kissimmee Trail Loop which circles Kissimmee for 7 miles and connects back to the Shingle Creek Trail at Warbird Blvd. 456-acre Shingle Creek Regional Park is a lovely oasis on Shingle Creek, at the headwaters of the Everglades. 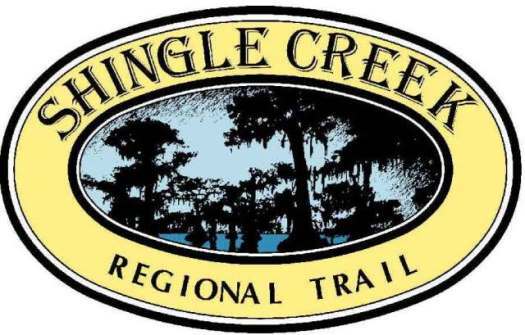 In addition to part of the Shingle Creek Regional Trail, the park has a boat and canoe/kayak launch, outfitter, fishing dock, hiking trails, picnicking, play area, and restrooms. Several old homes from the historic Shingle Creek community are within the park, and a Pioneer Village. The creek is named after the cypress trees that lined the bank in the late 19th century, which were used to make wood shingles.